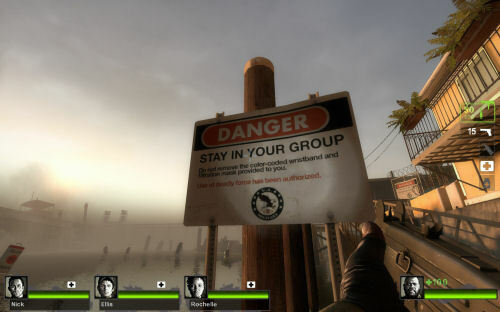 After a short delay on the PC, Valve finally released the demo for Left 4 Dead 2. We got a group together and headed to New Orleans in the demo's Parish campaign. After firing it up it became immediately apparent that quite a bit has changed in Left 4 Dead 2, despite people's perception of the game. Graphically the game seems a lot "cleaner" looking. Perhaps it's the bright lights instead of dreary nights, or the southern architecture instead of warehouses and rundown hospitals, but whatever it is the game pops off your screen a lot more. Whether these changes affect the atmosphere, tension and fear; well that's up for debate. There's certainly something to be said when you can see the gruesome details on the attacking zombie horde in broad daylight. It breaks a stereotype, and gives the game more of a 28 Days Later feel. Speaking of characters, graphically the character models got an upgrade. The survivors look incredibly detailed, and the zombies have a variety of noticeable improvements. It's easy to see the damage a zombie has taken; whether it's a cut across the chest or a the loss of a limb. I managed to grab a machete at one point and sliced and diced my way through the horde in extremely brutal fashion. Heads lopped off, arms fell by the wayside, and blood filled my screen. The aftermath of a machete massacre. 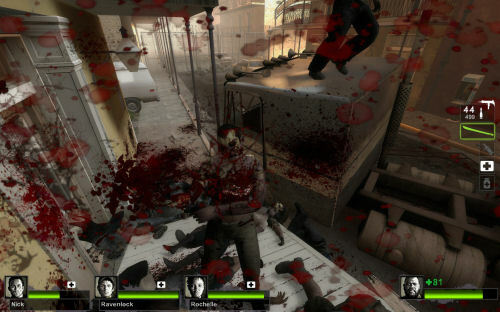 Yes Left 4 Dead 2 is quite a bit more brutal than the original. Blood seems to flow more dexterously, and when using melee weapons it easily covers your screen. Speaking of melee weapons I managed to snag not only a machete, but found a guitar and a frying pan as well. While the guitar did a great job of slicing and dicing, the frying pan's *thunk* sound was equally as satisfying. There were a few other new weapons in the demo, the AK-47 made quick work of zombies in mid-range combat, and the new auto (tactical) shotty cut apart hordes with ease. I found another shotgun, which I think was called the chrome shotgun, that worked really well too. 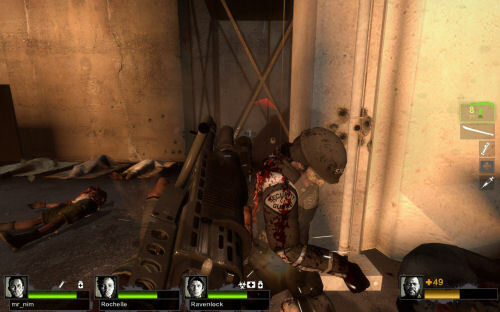 It wasn't as rapid fire as the tactical shotgun but worked quite a bit better than the original shotgun from Left 4 Dead 1. Our group did encounter numerous of the new special infected including the Spitter, who's acid is extremely deadly. The Jockey made an appearance a few times, as well as the Charger. None of these really surprised us, as we've seen them time and time again in the previews - though the Jockey's audio queue is quite creepy. What did surprise us were the unique infected characters that popped up. SWAT Team members need to be shot in back to bring them down. New Orleans seemed to be an evacuation zone for the infection, with clues littered all around and numerous security stations set up. So with these came SWAT team zombies that wore bullet proof vests and helmets. This made them extremely difficult to bring down, and you needed to work with your team to attack them from the rear. The biggest moment, and probably difference in the game, is the the crescendo moment of the 2nd level. Instead of hitting a switch and defending an area, you are forced to make a run to turn off an alarm to stop the horde from coming. It ends up being a mad dash with zombies leaping over the fences, and quickly surrounding your team. It's absolutely crucial that you stick together and cover all directions as you desperately try to turn off the alarm. We died here. A lot. But hot damn if it wasn't fun. There's just enough mixed up with Left 4 Dead 2 to make it feel fresh. After playing the demo a few times, go back and fire up Left 4 Dead 1 and I think it becomes apparent just how different it is. November 17th is only a few short weeks away, but for us, it can't come soon enough.